homify 360° thought you deserved some relaxation, and what better way to recharge than in a luxurious setting? So, with that in mind, we sought out an environment with grand interior spaces, large clear windows, and a chic atmosphere. Credits for these amazing surroundings need to go to Molins Interiors of Barcelona, Spain, who transformed these lush and striking visions into a Mediterranean residence that is the epitome of luxury. We’re talking sophisticated spaces, stylish ambience and perfect symmetry – the ideal elements that will surely aid in our quest for total serenity and calmness. Oh, and did we forget to mention a stunning ocean view? With that in mind, on with the tour! Forget gold – white is the colour that is synonymous with luxury, as clearly demonstrated here. A striking façade that is made all the more memorable by its simple design and ingenious mixture of materials. Generous glass coatings ensures that the house has an open and welcoming look, complemented ideally by that gorgeous garden. And who could possibly overlook that fantastic swimming pool, which is an essential element in our path to luxurious well-being? A house (do we dare call it that?) with such spacious exteriors should surely present the same roominess on the inside – and we’re ecstatic to confirm that it does. We’re not sure what is more striking to us: the glass balustrades with a light staircase floating to the top; a golden tone cast on the wooden flooring; pristine white walls; or that exceptional ceiling light adding a modern presence. In contrast to the wide open entrance, we find a lounge that is a bit more snug – still utterly stylish, though. The lower ceiling and closeness of the furniture make this space more cosy and familiar, and it is here where we’ll pause for a glass of Chardonnay while contemplating an afternoon beach stroll. We love the earth tones, velvety textured sofas, and chic coffee table that add a modern and dramatic flair. Notice how striking the black elements (the TV, vases, artwork, etc.) contrast with the whiteness of the walls and neutral tone of the furniture palette. Those accustomed to long, extensive dining tables can cast their eyes on this fabulous alternative. Without allowing anybody to be the head of the table, this dining table has everybody enjoying the meals and festivities on equal stylish ground. The darkness of the chairs and decor echo the touches we saw in the living room, and we love the complementary effect. Find some more inspiration for dining rooms, available in a multitude of styles and layouts here on homify. We reach the impressive kitchen space, which is definitely more light and bright. Large windows for natural lighting; light-toned wood; white finishes and decor… they all add to the soft embrace that welcomes us in here. A bright and elegant kitchen that gives off that luxurious Hamptons style. Notice how the flooring establishes two distinct sides to this space. Stone marks the culinary side where preparation and cooking will take place, while wood has been saved for the dining area, where the highlight is no doubt those intricate-looking dining chairs (copied ever so slightly by the light fixture dangling from the ceiling). Whether we want to indulge in a restful slumber or enjoy the spectacular ocean view, this bedroom is the space to be. The glass sliding doors bring in that sand-and-sea look perfectly. In order not to overshadow the glorious views provided here by nature, quiet neutral tones have been decided upon for the bedroom. Greys, beige, whites and blacks all deck out the room in superb harmony. A dressing space to match the luxurious elements that are in abundance in this house. A delicious blend of warm wood and white surfaces adorn the dressing space, which has been marked off from the more intimate bedroom area. Sufficient storage space means that we have no excuse not to dress appropriately, whether it’s for an afternoon walk on the beach, or a fabulous dinner soiree to be hosted at the swimming pool. Allow us to help you: Transform An Unused Room Into A Walk-In Closet. We conclude our relaxing tour with the bathroom space, which also boasts a delicious helping of natural light, no doubt thanks to that elongated skylight directly above the mirror. 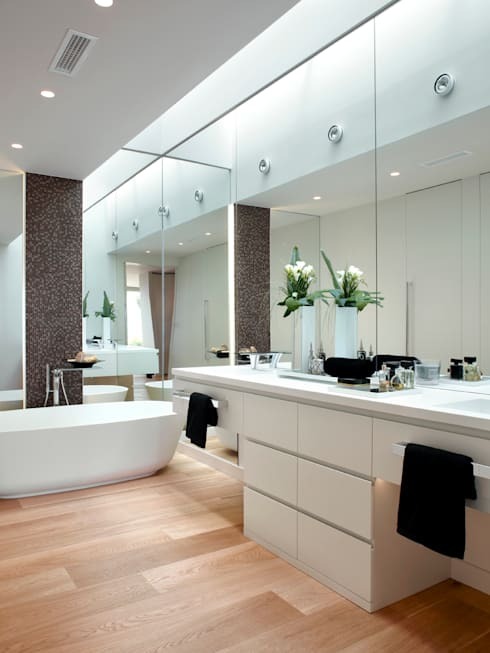 Add some twinkling downlighters and white coatings, and we have one deluxe bathroom to add to this chic residence. Contrast is definitely the order of the day here (but when has that ever been a bad thing? ), as those black towels offset most astonishingly with the surrounding light tones. It’s peace and tranquillity all around! Although we love this place, we can’t speak for everyone. What do you think of the house?